London Used Office Furniture, also known as LUOF, are market leaders in eco-friendly office clearances and relocations. Whether you're setting up a new office, moving your current office or maybe just looking to freshen things up a bit, we know that nobody enjoys the stress and hassle that can come with office relocation! That is why we offer our capable hands to help with this. We have a highly experienced and skilled office removal team who can offer a complete relocation service from start to finish without involving any third parties. Our friendly team have experience in fully project-managed relocations of any size, big or small. We offer you an upfront price, which is based on your individual job to get the most accurate, cost effective quote, with no hidden charges or nasty surprises. We don't estimate our costs, we assess your needs and requirements allowing us to remain extremely competitive in our prices. We offer an on time and on budget service with a guaranteed perfect delivery pledge, giving you a transparent office relocation with minimal disruption. Our service is totally flexible, and we don't sneak in services that you don't need. So each relation is tailored to your needs and budget, you chose what we take care of, meaning you decide how much involvement you have. All of this allows us to offer the most simple and stress free relocation. Here at LUOF our customers trust is the key to our success! What is the key to a successful relocation? There is so much more to moving than just going from A to B, so why not let us take care of all the stressful planning and organising, allowing you to just sit back and make the important decisions. We provide a tailored move planning service which is totally flexible and dictated upon your needs and requirements. We ensure that all health and safety practices are followed, including method statements and risk assessments. So whether your moving to a new floor, across the country or just having a small refurb, LUOF can help! We provide a 'one stop shop' service. We can move you, take away any old furniture you no longer need and can provide competitive quotes for new furniture. We offer a combined price for all services, allowing us to offset costs making us extremely price competitive. If that isn't enough to convince you, then maybe our 0% landfill mission statement will. We provide an eco-friendly service, recycling everything we can, leaving your company and ourselves with a clean carbon footprint. We can also provide health and safety, method and risk assessments and have full liability insurance. We pride ourselves on our excellent customer communication, and unfaltering attention to detail, allowing us to be extremely flexible and forward thinking. We also have expertise in planning and logistics from our fully trained and experienced staff. All of these things ultimately allow us to provide a personal, friendly yet professional service at the best price. Once you've accepted our quote and the dates have been agreed, you will be assigned a project move manager, who will be your main point on stance through your move. Your move manager will get in contact to arrange a meeting with the key people involved in the move to discuss your needs. They will attend a general site visit to assess the relocation, and discuss timings, requirements and limitations. This will be the time that you decide how much involvement you wish to have throughout the relocation and how much you would like us to manage. Following this meeting, we will provide you with a detailed move pack, including your relocation schedule, Risk Assessment Method Statement, confirmed dates and times, contact details and contracts to be signed. The benefit of having a move manager is to free up your staff's time and causing less stress for you. It also provides you with someone to answer any questions all the way through and suggest time and money savings, providing you with a more personal service. In addition to this, your move manager is on hand to anticipate potential problems before they arise, ensuring things are on schedule and eliminating any unnecessary delays. If you have personal crates included in your quote, these will be delivered prior to the start date, at an agreed time, along with any labels and packing materials agreed. The personal crates need to be packed by you and labelled prior to start date. You must ensure the crates are able to close fully. The personal crates are generally used for all contents of cabinets and pedestals. We would also require all furniture to be labelled as to whether it is to be moved, sold or removed. This should also be drawn up in your inventory with the assistance of your move manager. On the day of the move, our relocation team will attend site at the agreed time and bring crates/packing materials as per your quote. Our staff will disassemble all furniture which is to be removed or relocated and load onto our vehicles. Once the furniture, along with the crates and all other items are loaded, we will move to your new premises. Once there, we will reassemble all furniture and set up your new office according to floor plans. 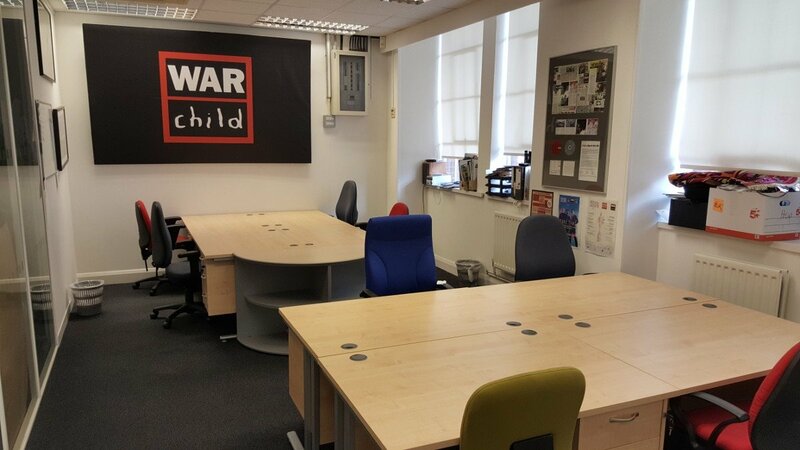 We ensure that both your old office and your new office are left in a clean and tidy condition, leaving you with an office that is ready for business. The personal crates will be left behind for you to unpack at your leisure and we will arrange a convenient time to collect once you have finished with them. Once you are fully satisfied with your relocation, we will provide you with your aftercare pack which outlines any changes which have been made that you need to inform your staff of, along with any documentation and certification should any of your items of been recycled. "We were really pleased with the prompt response we had from LUOF when we first approached them, our lead-in time was quite short but they responded and met our time line - the actual move was painless and the staff courteous and efficiently throughout. The quality of the few pieces of second hand furniture we purchase was in very good condition and well priced. Disposing of our old office furniture was dealt with without question. We would recommend them." "London Used Office Furniture were the most professional, friendly and reliable movers that we have ever worked with. True great bespoke service, catering to our exact needs, without hesitation. Would highly recommend and look forward to working with them in the future"
"An extremely helpful and reliable company to work with. We changed our order a few times and they were more than happy to apply these changes without any issues, delivered on time and were efficient on arrival. We will definitely be using them again for any future office needs." "The team really were efficient, and Dean was great as he was there on the first day to lead them. They were really tidy, which helped as they had managed to relocate all of my items, and as all was organised- I found everything at the other end. They were all friendly and helpful, and early to start, which is a bonus."